Tho' I lo'e them as well as a daughter should do, They're nae half sae dear to me, Jamie, as you. He said, "Think nae lang," &c.
I sit on my creepie and spin at my wheel, And think on the laddie that lo'es me sae weel; He had but ae saxpence, he brak it in twa, And he gied me the ha'f o't, when he gaed awa'. Then haste ye back, Jamie, and bide na awa', Then haste ye back, Jamie, and bide na awa'; The simmer is coming, cauld winter's awa', And ye'll come and see me in spite o' them a'. An' O! my Eppie, My jewel, my Eppie ! 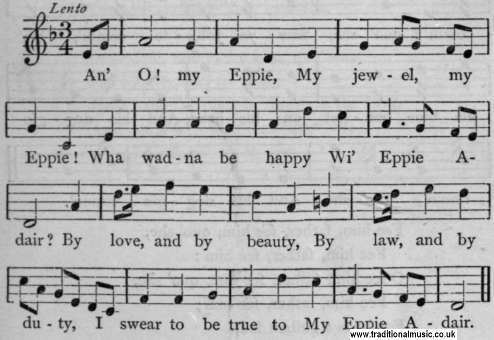 Wha wadna be happy Wi' Eppie Adair ? A' pleasure exile me, Dishonour defile me, If e'er I beguile thee, My Eppie Adair!